Portuguese artist Joana Vasconcelos is currently one of the most spirited women artists on the international contemporary art scene. In 2012 she presented an impressive array of her works at the Palace of Versailles, and in 2013 she represented Portugal at the 55th Venice Art Biennale, where, in spite of the financial difficulties of her country’s national pavilion, she shipped the pavilion – in the form of a ferryboat – from Lisbon to Venice herself. 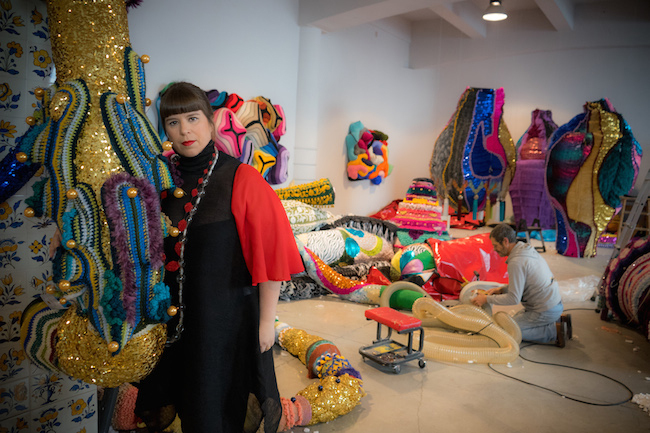 20 years ago Joana Vasconcelos began her artistic career in a 50-square-meter studio, but today her 3000-square-meter atelier is located in a former cereal warehouse, in Lisbon’s harbour area. Creating an atelier was the result of a brave realization – Vasconcelos understood early on that her strong sides were the conceiving of ideas, and work organization. Today her work methodology is based on careful planning in terms of choice of materials and composition. At the atelier, the order of production is the following: Vasconcelos creates sketches which are then given to the architecture department headed by her husband; there the technical drawings are developed, which are then given over to production. Vasconcelos’ works make up a kind of anthology on the relationship between artisanship and the art of today. They consist of both the historical and the contemporary, of skilled craftsmanship and artistic flights of fancy, of the collective and the individual, of modesty and ambition, of usefulness and aesthetic value, and of the handmade and the ready-made. I met with Vasconcelos in the Danish city of Aarhus in October 2016, which is when her exhibition Textures of Life opened on the lower floor of the ARoS contemporary art museum (October 14, 2016–February 19, 2017). Sixteen of Vasconcelos’ works are on view, among them: the high-heeled shoe Marilyn (2009), which first entered the spotlight at the Versailles exhibition; the dramatic kinetic sculpture Burka (2002); and a piece from her early career, Meeting Point (2000). Although Vasconcelos puts together more than twenty shows a year, this exhibition is a rare opportunity to see this selection of works. The central work in the exhibition is the 50-meter-long textile installation Valkyrie Rán, the largest work in Vasconcelos’ iconic Valkyrie series; after this showing, it will become the most voluminous item in the permanent collection of ARoS. These bright, organically-shaped creatures have been a well-known part of Vasconcelos’ oeuvre ever since the Versailles exhibition, and the series’ popularity was notably underscored by the 35-meter-long Valkyrie Octopus commissioned by the Chinese luxury hotel MGM Macau in 2015. If we were to speak of this wondrous Valkyrie as a living creature, could you explain where its head is? How is its body formed? How do its limbs function? Yes, I can. It is a very organic and humanized object. Its head can be found by the museum’s main entrance. Its body – the main rainbow structure with all of its limbs – winds throughout all of the museum’s floors. The blue tail, however, points to the ocean – an aspect that unifies Portugal with Denmark, and one that is linked to the broader poetics of sailing and dreaming of a world that is much larger than the one we can imagine in our limited scope of things. Could you explain what is the exact connection between this creature and the female figure of the Valkyrie from ancient Norse mythology, which also has roots in Denmark? In Norse mythology, Valkyries are goddesses who fly over the battlefields and pick up the brave warriors to bring them back to life – so that they can now work for the gods. They have a very strong power, so in a way, my Valkyries are flying over the art world and bringing it alive. It is a kind of association. You took karate lessons as a child, and you have said that certain aspects of the martial arts have been helpful in your work with art – in terms of attaining goals and getting results. This is a question of discipline, but the martial arts also require one to give up control at times – when the body knows what it has to do without even thinking about it. Do you agree that an artist just knows what she/he has to do? Do you agree that the artist is just a medium between the world and something loftier? I think that one of the most important things with karate is its connections within you – that grounding that karate can bring about in you. Get grounded! You feel the movement, you feel the body – it is very real, it is very strong, and also very demanding. To be able to practice karate, you need to be focused. Karate taught me all of the techniques that I use to create my pieces. But, of course, in karate there is no space for imagination, no space for creativity. So, with my knowledge of karate, and by adding the creativeness that I naturally have – I am able to produce my work. Your works often require very technically complicated forms of execution, for example, Full Steam Ahead – a robotized fountain built with steam irons – which is also on view here at ARoS. Have you ever had to abandon an idea because of the technical constraints inherent in its execution? Once or twice. But not many times because, the truth is, when I have an idea, I find the right solutions for it. Otherwise, there is no idea. Sometimes we need to take a technology and twist it so that it can make the idea happen; it can take years to develop the right kind of technology. It’s a kind of game, with the goal of producing pieces that have never been done before. In 2012 you presented your works at the Palace of Versailles. When looking at your works displayed within this centuries-old château, I would think of their impermanence. Your works tend to be made from feathers, textiles – materials that are not very durable. Do you think about the fleetingness of your works? I understand your question, but your question is not valid. I will tell you why: because everything disappears – in a few years, an oil painting will start showing problems, buildings eventually disappear, even nature… Everything perishes – on different time scales, but it does. There is no such thing as permanent materials. It is a fake idea – that one must make things that will stand throughout time, forever and ever. It is a double question because we cannot know if all of the buildings (including this one) will still be here in two hundred years. The material that will last the longest over time is plastic; everything else – both objects and materials – will perish much sooner. Because we have a choice of what materials to use, you can make doubles of your work so that they can be, in a sense, suspended in time. All of my pieces are made from materials that are abundant enough that another one can be made. That’s a way to go about it! And, of course, all of the documentation and films – they will record all of this. So, it’s not true that they will disappear; they might disappear physically, but they will always exist. When we talk about the concept that art should be permanent – it will be: people will talk about it, and there will be books about it that will make the art live on through time. I don’t have this kind of a production system that is intimate and private. There is this romantic idea about the artist who works alone, is an addict, depressed and poor, but if we look at Rembrandt, Rubens or Velázquez – they were managing big studios; these guys were known, and they were showing big things. It was quite common, this tradition of big studios with large-scale productions, large teams, and very strong dynamics, social dynamics. Yes, it is different from an artist who is alone in his small studio and just paints. It is neither better nor worse – it is as it is. We cannot put all artists into this little cage-like idea. We are diverse. And everybody finds his or her way to exist. My studio – with a lot of people – is a crafts studio. Everything is done by hand; it’s a handmade process. It’s not mechanical, it’s not industrial, and it’s not very technological. I rely on people’s knowledge, on people’s hands. In a way, I am more of a Rembrandt- or Rubens-studio than a technological studio of the kind that exist today – the kind with lots of computers, a lot of machines, and a lot of industrial production. I am not that studio; I am a crafts studio. It was great mark in my career and a dream come true. It’s something of which I’m really proud of as it was also the most visited exhibition in Paris in the last 50 years, welcoming over 1.6 million visitors. My works were perfectly framed by the palatial environment, as if they had always been there. And, at the same time, they also created certain uncanniness, due to their materials and forms, more or less recognizable. Take for example two pieces, Marilyn – composed of stainless steel lids and saucepans –, installed in the mythical Room of the Mirrors; and the majestic Golden Valkyrie – textile work, suspended from the ceiling, formed by large, strange and surprising textile bodies –, suspended in the grand Galerie des Batailles, among the monumental paintings that cover the around 150 metres long room. Moreover, this exhibition placed me within the restrict nucleus of only nine contemporary artists that had the opportunity to exhibit in Versailles, all great names of contemporary art, such as Jeff Koons and Anish Kapoor. Recently, in an interview with Arterritory, the well-known French sculptor Bernar Venet said that there should be a heroic aspect in the process of creation. And that there must be radicalism to the idea. You both have something in common – he is also one of the nine artists who have been invited to show their work in the revolutionary series of contemporary art exhibitions at the Palace of Versailles; you both also work in large scales. Do you consider your ideas as being radical, and do you feel a heroic spirit in you? No, I don’t. I don’t feel radical or heroic. That’s because I feel that I’m trying to communicate with the world not from a superhero point of view, but from a domestic one. It is the exact opposite of Venet. Venet’s works are made of iron, they feature strong figures, and they are super large – always! My hairdryers are not super large, they’re just hairdryers. They don’t intend to be heroic, they don’t intend to be majestic, but in their own way – they are. My work is very personal, very intimate, very understandable, and yet it can talk about many different things. Venet’s pieces are heroic and enormous... They have poetry, but lack in ambiguity. And without ambiguity, it’s difficult to have different opinions. If you have a work that is closed – it’s just that; if you have a piece that has different meanings or various backgrounds, you can also interpret it through your own culture, your own age, and your own experience. You are an artist committed to human rights and, in particular, to the role of women in our society. Portuguese women gained full legal equality on par with men only relatively recently – with the 1976 adoption of the present constitution. You were born around the time when these changes were taking place – was the formation of this new societal order what inspired you to take an interest in these issues? It served as a starting point. I was influenced by the memory that remained from those times. My grandmother, for example, was a woman with an artistic flair but she was only free to pursue her love for painting much later in life. My interest in crochet, for example, is linked to the fact that it is part of our shared memory as something that belonged in our grandmothers’ homes; somehow, we tend to claim that crochet is something exclusive to our culture, when in fact it’s made all over the world, so, in that sense, it’s very global. The thing is, while most countries in central Europe had long forgotten this technique, Portuguese women kept on making crochet, a practice that ended up being preserved by a particularly isolating five decade-long dictatorship. Furthermore, crochet has always been a very private thing. Confined to the family home, women who had not yet conquered their place in the job market passed on this tradition to their daughters, and this is how you can still find so much crochet in Portugal today, although it’s sort of hidden now. Additionally, I’ve always been interested in their double function, seeing they not only protect the furniture, but are also decorative. I use it in my work as a pattern, as pieces of a puzzle, and whereas they once were the product of women’s isolation in the family home, in my work they appear on the outside, enveloping other objects. This work speaks about the status of women in Europe. We may not wear the burka, but we do wear skirts. Inspired by the Portuguese legend of Seven Skirts of Nazaré, in the multi-layered skirts of my installation we see several fabrics: the red polka-dotted fabric of the Spanish flamenco dancer; a flowery print; a fabric used in cabaret costumes; Burberry tweed; American army camouflage used during the war in Afghanistan; a sari… and hanging over them all, the burka. While we are in a period during which so many women have to wear the burka, we are not free. We are all under the burka, even if we can choose the fabric – the texture of our lives; we are still under it. This is not a simple work; there have been several instances where I have not been allowed to display it, including at Versailles. It may not be a beautiful and fashionable subject, but it makes one think about a reality that should change. About women who are repressed or punished for overstepping certain norms. Isn’t there a certain aspect of heroism in this work, nevertheless? I don’t feel that I am heroic; I feel that when I have to do something, for instance, the Valkyrie in here, I have designed it for the space. The space is big. I didn’t design the space, the architects did, and they were heroic – I was just filling in the gaps. If it were a small space, it would be a small piece! It is not my decision. And if you ask me today about the scale of my pieces – I don’t know if it is three or four meters high. I am not talking about scale; I am talking about meanings, about contradictions in our lives and the problems that they bring – about how one thinks about having to be a woman today… with high heels, with the tradition of women keeping house, how we relate to family traditions, how we relate to our professions, how I relate to mine, etc.